Bradfield College Art Department. Virtual gallery of artwork by secondary school students. A history of the African National Congress. The Berlin Wall at berlin1989.com. The art collection of the fall of the Wall. Presentation by Artists for Freedom. Parks Canada. 'On behalf of the people of Canada, we protect and present nationally significant examples of Canada's natural and cultural heritage and foster public understanding, appreciation and enjoyment in ways that ensure their ecological and commemorative integrity for present and future generations. ' A huge cultural and ecological resource. Green Museum. A website of environmental art. From the about page :- 'greenmuseum.org, a new online museum of environmental art, advances creative efforts to improve our relationship with the natural world. Our goal is to inform, inspire and connect people through environmental art and encourage the creation of new work that serves our communities and ecosystems'. If frogs sicken and die, what will happen to the princes? A visit to Antigua Ciudad Guerrero. Antigua Ciudad Guerrero, on the US-Mexican border, was flooded by a dam many years ago. About 8 to 10 years ago, the town's ruins were exposed by falling water levels. The town is now a regional tourist attraction, and the page includes photographs of this interesting place. You can donate water with a mouse click, for free, at givewater.org. Further coverage on this issue from the BBC. Loren has been writing about Thoreau recently. Please take a look. 'One afternoon, near the end of the first summer, when I went to the village to get a shoe from the cobbler's, I was seized and put into jail, because, as I have elsewhere related, I did not pay a tax to, or recognize the authority of, the State which buys and sells men, women, and children, like cattle, at the door of its senate-house. I had gone down to the woods for other purposes. But, wherever a man goes, men will pursue and paw him with their dirty institutions, and, if they can, constrain him to belong to their desperate odd-fellow society.' - Walden. Rice Bowl Journals. A directory of weblogs from Asia. Money laundering news. Via Sassafrass. Greenswitch.org. A very good environmental/sustainable technology blog. Perry-Castaneda Library map collection. Maps of many regions of the world. Streakerama. A celebration of streaking. Not suitable for work, obviously. How Saddam 'staged' baby funerals. On the road with the amiable army. 'England's fans have changed this World Cup. Vivek Chaudhary on a new lack of malice.' (Guardian) Via Fat Buddha. Washington DC weblog map. By Maureen. London: A Pilgrimage. By Dore and Blanchard. Models of the Crystal Palace. Via Monuments and Dust: The Culture of Victorian London. Punch and Judy. Fun history of the puppet show. Mandela for President. 1994 election poster. Cut-the-knot.com. Interactive mathematics miscellany and puzzles; fun site. Eric Weisstein's World of Mathematics. Extremely comprehensive online mathematical encyclopaedia; over 10,000 entries. Utopia on the Internet. Communities and literature, classic and modern, on the subject of Utopia. Functions and claims of Utopia. The Commonwealth of Utopia by James Harrington, 1656. Svanholm. An intentional community, 60 km from Copenhagen. Findhorn Foundation, an eco-village in Scotland. The site includes a virtual tour. Ascension Island Heritage Society. Ascension's museum. Ascension's history and a stamp display. Ascension Island's Post Office Philatelic Bureau. 'Ascension Island was known as the Sailor's Post Office as early as the seventeenth century. Ships passing Ascension would call at the island and leave letters for others going in the right direction to deliver. The eastern head of the Island is called Letterbox, although no trace of the spot used to deposit letters remains today. ' The island has red letterboxes, too. Stamps from Ascension and St. Helena can be bought from the online store. The Islander is Ascension's excellent newspaper. Greenpeace has a weblog. Via Rebecca's Pocket. 'And that makes the Oscar-winning director distinctly uneasy ... ' (ABC) (via Unknown News). (A useful development in some ways, profoundly disquieting in others. There is a huge potential for abuse in this technology, especially in the current climate). In pictures: Mafia boss buried. (BBC) John Gotti's funeral. Related links are on the right hand side of the page. Painting the Weather. Over 100 paintings of British weather, from 50 galleries and museums. Nubia. The geography, history, culture and economy of an ancient African civilisation; from the Egyptian State Information Service. Some holy wells and springs of Britain. Trees, glorious trees. British trees and their traditional uses. A collection of Zen koans. From Ordinary Mind. 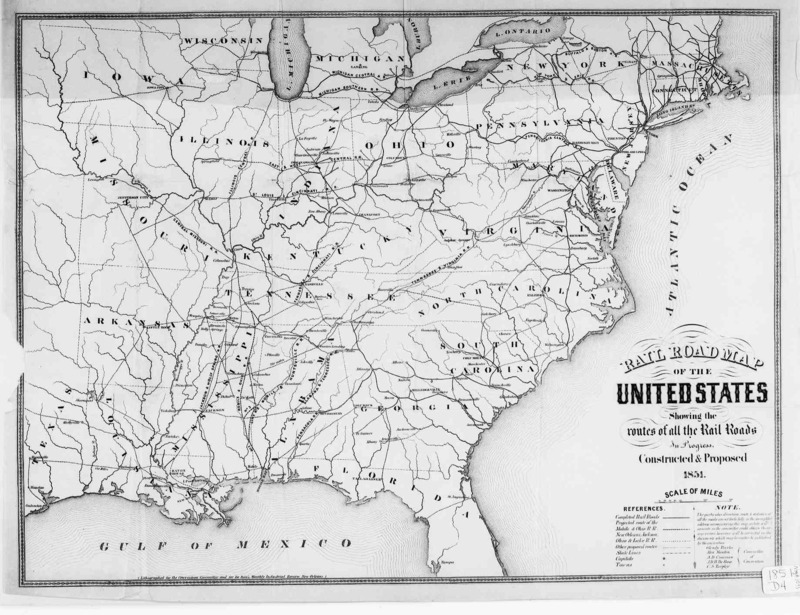 Railroad map of the US, 1854. Via Hargrett Library Rare Map Collection - Transportation. Historic rail and road maps from the US, from the 19th and early 20th centuries (tending to concentrate on Georgia and surrounding states). Words and Pictures Museum. A really excellent museum about cartoons and comics, worldwide. Shekhar Gurera's cartoons. Caricatures and editorial cartoons from India. Baha Boukhari Cartoon. Palestinian cartoons. Planting trees for the Golden Jubilee. Cartoon Art Museum, San Francisco. Good stuff here, such as an exhibit on the art of Spiderman. Favourite Poem Project. Americans choose their favourite poems. Potted history of football, in all its forms. Anthropology on-line exhibits, from the Pacific voyages of Rollo Beck to the Victorian kitchen. Carlo Vidua and the travellers of 1800 in Egypt. 'An exhibit of writings and names of travellers engraved on monuments in Egypt'. A lovely, fascinating exhibit. Jane's Addictions. Outsider and visionary art, and folk art environments. One of the best outsider art sites I've seen. Beating swords into plowshares; converting ICBMs into peaceful space launchers. Space rocket launch sites around the world. Rebuilding Poplar Cottage, a wattle-and-daub thatched cottage. An interesting site which covers the reconstruction of various buildings. The Historical Thatched Cottage, Centerport, NY. (Like several other links today, I found this on Metafilter). Interviews with failed suicide bombers.